The artist Vincent van Gogh once said, “For my part I know nothing with any certainty, but the sight of the stars makes me dream.” If Van Gogh were alive now, would he feel the same way? Today, manmade lighting results in urban night skies that are hundreds of times brighter than they were in 1889 when the twinkling Milky Way inspired Van Gogh to paint The Starry Night. Today, according to the National Oceanic and Atmospheric Administration (NOAA), the overabundance of artificial light prevents eighty percent of Americans and one third of humanity from even being able to see the Milky Way. As populations expand from city centers, as is happening here in Central Texas, so does the amount of artificial light. We light our streets, our backyards, our parking lots, our buildings, and our sports arenas. Whereas artificial light is a useful and sometimes necessary tool, unintended consequences stemming from its excessiveness and poor quality are beginning to take a toll on human health and on our precious wildlife. A naturally dark night is more than artistic inspiration, it is vital for the survival of many species, including our own. Like those of most species, our sleep and wake cycles, or circadian rhythms, are governed by the cycles of day and night. A dark night leads to deeper sleep, which is essential for melatonin production. Melatonin is the hormone responsible for a healthy immune system, lower cholesterol levels, and a properly functioning endocrine system. The presence of artificial light at night can disrupt this important biological function and cause a multitude of health problems. For other species, including many native to Central Texas, ecological disruptions caused by artificial light can be dire. The glare from artificial lights can interfere with nocturnal breeding rituals of amphibians such as frogs and toads, leading to declining populations. Many times, artificial lights trick birds into misjudging seasonal weather and/or directional cues. Their confusion can cause them to migrate too early or late and miss ideal nesting weather and conditions. Often, a bright night disrupts the ability for nocturnal hunters to find food and for their prey to find cover. Insects which play important roles in pollination, pest control, and nutrient cycling are dying from exhaustion or as easy prey at alarming rates due to their attraction to blue light. These are only a few of the many examples of how artificial light is greatly impacting our ecosystem. 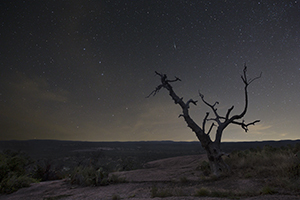 In order to protect our iconic Texas wildlife, the health of our community and our big and bright night sky, it is imperative to address the growing issue of light pollution. HCC recently partnered with the Hill Country Alliance (HCA) and the International Dark-Sky Association (IDA) to determine how we could proactively mitigate excessive light problems here in Central Texas. Under their guidance, and in partnership with private landowners, HCC developed the most sophisticated and thorough easement terms in Texas to date related to night sky protections. These dark-sky protections are currently included in a number of HCC’s recent conservation easements such as the easements on Puryear Ranch and Inspiring Oaks Ranch. In addition to limiting development and protecting water and wildlife, HCC’s conservation easements now extend the landowner’s land stewardship best practices to the sky above. Some of the IDA recommendations HCC used in these easements also translate to general use. Simple lighting modifications, such as installing covers to focus light downwards and using less wattage whenever feasible are effective ways to reduce exposure to artificial light. The color of outdoor light is an equally important consideration. Cool light, or light with blue and/or white in its spectrum, is the light most often found in energy efficient LEDs. Unfortunately, cooler light brightens the sky more than any other light and has the most negative impact on wildlife; therefore, the IDA recommends using warm light, or light with more yellow in its spectrum, for outdoor lighting. Local Hill Country communities are joining HCC and area land-owners in the pursuit of preserving the Hill Country’s dark-sky heritage. The Texas Hill Country is now home the three IDA accredited Dark-Sky Communities (Dripping Springs, Horseshoe Bay, and Wimberley Valley) three Dark-Sky Parks (Enchanted Rock, South Llano River, and UbarU Camp and Retreat Center) and two Dark-sky neighborhoods (Lost Creek and River Hills). An IDA accredited Night-Sky designation, “recognizes and promotes excellent stewardship of the night sky.” Obtaining this distinguished designation involves extensive public education and the adoption of community-wide regulations around smart lighting policy. Currently, according to Dripping Springs City Administrator Michelle Fischer there are more active groups working on developing dark-sky ordinances or getting dark-sky certified in the Texas Hill Country than in any other area in the world. That is something of which to be truly proud. HCC lauds the efforts of the Hill Country land-owners and communities who have committed themselves to protecting our views of the night sky and to preserving the well-being of their neighbors, both human and otherwise. If everyone in the Hill Country continues to work together to preserve our big and bright sky, Central Texans will be able to see and, if so inspired, paint the twinkling Milky Way forever. To learn more about how you can improve your ourdoor lighting, click here.